Manta ray snorkeling in Hawaii is an absolute must for your bucket list. Our swim with manta rays at night was terrifyingly amazing. Since I still feel short on superlatives, let me first give you a two-word summary of the excursion: absolutely incredible. When I first heard that there were excursions on the Big Island that take you swimming with manta rays, I was elated. These gentle giants largely remain a mystery to us, are vegetarian, and can grow up to 30 feet in width. Then, I learned that the excursions, although not too far from shore, take place in open waters. A little bit of fear crept into my excitement at that point. In retrospect, the location of the activity should have been quite obvious given the animal’s size. Then, I learned that the excursions take place at night under a starry sky. That’s when my heart sunk and my slight fear turned into mild terror. Reading reviews about how gentle the manta rays are, or how the activity can be suitable for the young and old, or about how the risks of shark encounters are not very high during this activity definitely don’t do anything to quell the fear associated with swimming in the ocean at night. However, after weeks of hesitation, I was won over by the prospect of meeting these incredible giants of the sea and my wife’s steadfast desire to try this once in a lifetime experience. Skipping forward a few weeks, my wife and I were now on our way to the south-western coast of the Big Island to meet our sea transportation at the docks. The excursion began right before sunset on a speedboat with a very small group of people. The young and knowledgeable staff gave us great snacks and information on the way to the dive site while trying to ease any fears. After approximately 20 to 30 minutes, we arrived at the dive site with a beautiful sun just about to set past the horizon. We were definitely not the first to arrive. Between 10 and 15 other boats were already on site, with a few that had snorkelers already in the water. Although the sunlight faded very quickly, each boat had arrays of flashlights floating on the water and pointing downwards to excite phytoplankton that the manta rays feed on. The sky and water eventually turned pitch black with spots of light blue emanating from areas of the water where snorkelers are congregated. The artificial light did help alleviate some of the fear of diving into the dark. That particular night, the swells were quite high (heavy storms made their way to the area the next day) and the water was choppy. As a result, our guides kept us in the boat even as the snorkelers and divers from the other boats entered the water one after the other. They told us that in the wet suits that we will wear, we can only spend about 45 minutes in the water because of the cold. So, they wanted to wait until the other groups spot manta rays before sending us into the fray. The minutes started passing and there were no signs of mantas. One of the other groups briefly screamed in excitement as they saw one manta, but that quickly dissipated and the manta disappeared. Our guides told us to be patient and that on an average night, 7 manta rays will swim amongst all the tour groups. However, even more minutes passed by and eventually the first boat started recalling its crew. Then a second boat called back its divers. Then a third. At this stage, it seemed that the excursion was going to be a bust as almost all boats are loading up and leaving one by one. The guides blamed it on the turbulent waters, and started trying to schedule a return to the dive site at a later date. However, they decided that since we made the trip all the way there, we should don the wet suits and get into the frigid waters just in case. There was only one other boat left at this stage so the setting bordered on terrifying for anyone afraid of dark ocean waters. However, the cold air seemed to have injected me with a dose of fearlessness and I got into the water to make my way to a flotation device that holds all the flashlights pointing into the water. We all floated and waited for something to happen. Our faces were pointing in the same direction as the lights in the ocean, with a view on emptiness. Ten minutes passed. Nothing. Then, in the distance, about 150 feet below us, some movement. A few more minutes passed. Nothing. Suddenly, out of nowhere, a giant manta ray swooped up to the surface to feed. It made its turn just a few feet away from us. Incredible. It turned back from the bottom and came back close to the surface. It made circular trips from deeper in the water to within a few feet of us again, and again, and again. The wait was worth it to see this animal from that close. It is about 12 to 15 feet in width; positively huge. Then, a second manta ray closed in and started its orbit to feed near the lights. Then a third, a fourth, and a fifth. Beyond incredible. 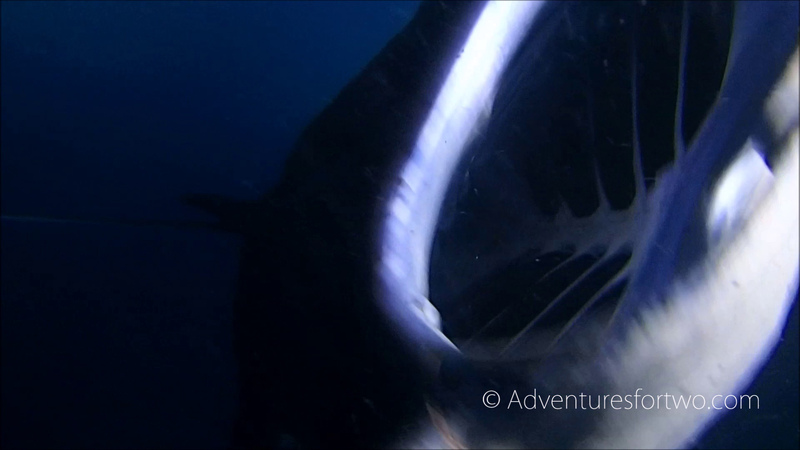 The mantas got closer and closer to us, to the point where a manta touched me as it swam past with its mouth open to eat the plankton. In Hawaii, when a manta ray touches you, they call it being “touched by an angel.” The sea angels seemed to have an affinity for me that night. I was touched by an angel several more times as they had no fear while swimming past me. Sometimes it was the underside of the belly, other times the tail, or a wing. I seem to be in the way of their food. They orbited near us continuously for around 30 minutes. As the cold set in, I knew it was time to return to the boat very soon. However, there was one manta ray that had a surprise for me. She orbited below me with her mouth closed. The fact that her mouth was closed indicated to me that she’s no longer feeding. Now, it seems the animal is curious about me. She shifted her path a little, made another go, and came a few inches closer to me, this time a little towards the front. Then she tried again and came a few inches closer. Finally, she swam toward me with her mouth closed and hits me headfirst. She seemed to have planned her itinerary carefully so as to hit me without hurting me. In this moment I’m simultaneously excited and terrified because even though the creature is a gentle giant, it is still a giant and I’m an ocean of black water. So happy that the manta experience is unforgettable for you. You were lucky to have experienced crew on your boat that timed it perfectly. The mantas have names and you saw Sugar Ray, Eli Ray and Tim Ray. How do I know? my team documents, observes and films these magnificent creatures for over 20 years. I would like to invite your readers to learn more about the individual mantas and their personalities: http://www.MantaAdvocaresHawaii.com/library.html. ~ Aloha! Thanks Martina. I saw a couple more manta rays that night that weren’t in these two videos. I will definitely try to identify them too! Great videos! Looking forward to seeing more! What an incredible experience this must be. Definitely something to check out if we make it back to the Big Island some day. Thanks for sharing!